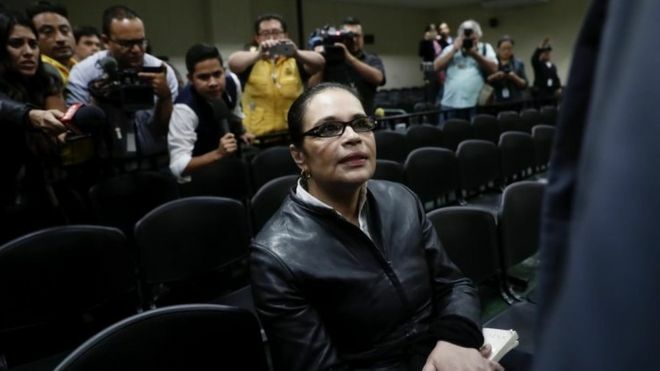 A court in Guatemala has sentenced the former vice-president, Roxana Baldetti, to 15 years and six months in jail for her role in what became known as the "Magic Water" scandal. Prosecutors said that she embezzled millions from a state fund set up to decontaminate a lake. The chemical formula used as part of the clean-up was an ineffective solution of water, salt and chlorine. The deal was negotiated by her brother, Mario, who held no official post. He was sentenced to 13 years in jail. In his verdict, Judge Pablo Xitumul said that Ms Baldetti was the mastermind of a scheme devised to defraud the Guatemalan state. She agreed to pay almost $18m (£13.7m) to an Israeli company to clean up the Amatitlán Lake. However, the chemicals being used in the decontaminations scheme turned out to be mostly water and salt - leading the scandal to be dubbed "Magic Water". Guatemalan media have hailed the verdict as historic, in a region where the rich and the powerful have traditionally enjoyed impunity. Several Guatemalan officials and the Israeli businessman, Uri Roitman, were also sentenced to jail. Ms Baldetti left office in disgrace in 2015, after the biggest anti-corruption protests the country had ever seen. She is currently awaiting trial in a customs fraud scandal dubbed La Línea (The Line), involving the payment of bribes by private companies to Guatemala's customs service. Prosecutors have implicated Ms Baldetti and the president at the time, Otto Pérez Molina, in the corruption scheme. Mr Pérez Molina was detained at the end of his term in 2015 and remains in custody, awaiting trial. Both of them deny the allegations.